Back by Popular Demand: Special Workshop Series! You may have heard that improv and roleplaying have a lot in common. It's true! You can apply many of the same skills used in improvisational acting to make your game rock, like creative collaboration and taking risks to drive your story to unexpected places. We'll explore improvisational acting as it applies to roleplaying through some fun and low-pressure exercises. You'll learn just what "Yes, and” means, practice active listening and trust building, and celebrate getting into trouble! Beginners to improv are welcome and encouraged. Bring an open mind and excitement to try new things! Improvisational acting teaches many skills that can make your game rock, like enthusiastic collaboration, creating dynamic stories and characters, making bold choices, and taking narrative risks. But it's not just for players! 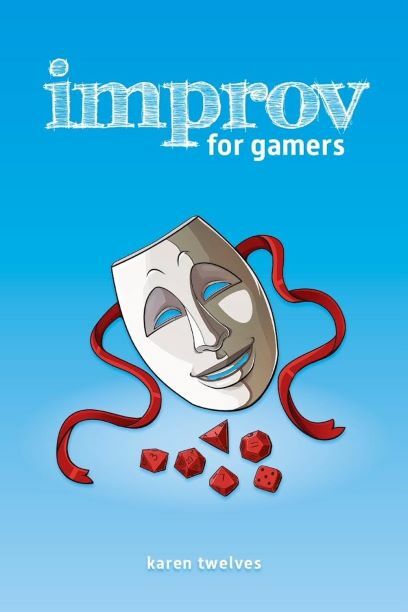 In this workshop, we'll be doing some skills-based improv exercises to practice GM skills like rapid characters, pacing and cutting scenes, and working together as an ensemble to share focus. Be prepared to be in the spotlight! Beginners welcome! Many of the skills used by improvisational actors to tell compelling stories on stage can also be used by live-action roleplayers to create engaging in-game experiences. We’ll play together to explore skills specifically relevant to larping—shifting status, full-body characters, sharing the spotlight, and working with invisible objects. Beginners to improv and/or larping are welcome. A) I waive the right to file any claim or lawsuit against AL, his affiliates, instructors, students, members, employees, agents, volunteers, and representatives (hereafter referred to as “Releasees”), for any injury, damage, or loss resulting from my participation in Activities, including those resulting from the ordinary negligence of Releasees. This includes, but is not limited to, claims of injury due to faulty premises or facility, inappropriate or defective equipment, inadequate supervision, and improper instruction. I further make this agreement releasing Releasees from liability for ordinary negligence on behalf of myself, my family, estate, heirs, and assigns. C) I agree to hold harmless, defend, and indemnify AL (that is, defend and pay any judgment and costs, including investigation costs and attorney’s fees) from 1) any and all claims of mine, my spouse, estate, heirs, or assigns arising from my injury or loss due to my participation with AL and 2) against any and all claims of co-participants, rescuers, and others arising from my conduct in the course of participation with AL. D) I hereby grant to AL the right to: (1) photograph, video, and audio record the undersigned during any class or event offered by AL and (2) reproduce, distribute, display, create derivative works of and otherwise use the undersigned’s likeness for any legitimate purposes by any media. I hereby waive any right that I may have to inspect or approve any photograph, video, audio recording, likeness, or derivative work thereof (collectively, the “Material”). I have no right to control the use of the Material, and I will not receive any payment or other compensation in connection with the use of the Material. I agree that photography, video, and audio recording during any class or event offered by AL is prohibited without the express written permission of AL. E) I agree that all disputes, controversies, or claims arising out of my participation with AL shall be submitted to binding arbitration in accordance with the applicable rules of the American Arbitration Association in effect at the time of the claim. F) I also authorize AL to secure emergency medical care and transportation in the event I am incapacitated and I assume financial responsibility for any expenses. G) I assert that 1) this agreement supersedes and replaces all previous agreements, whether oral or written, between parties on the subject matter contained within, and 2) that this is the entire agreement between AL and me.